UDM Downloads > The Ringtone Maker Plus! 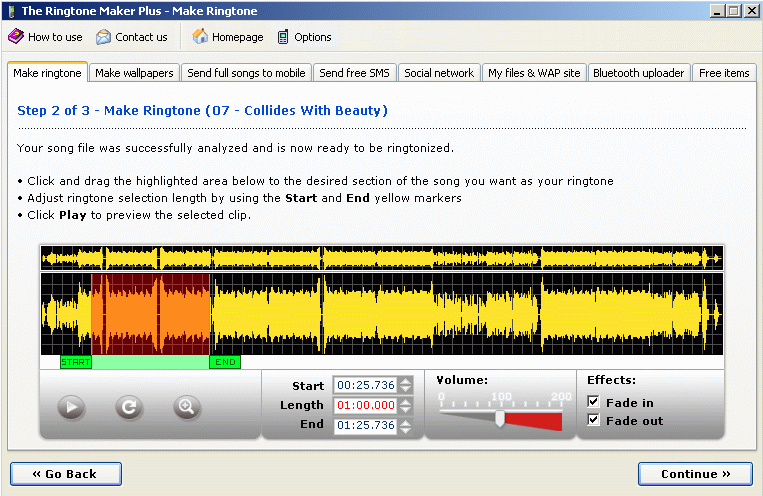 The Ringtone Maker Plus is an unlimited, unrestricted editor to create 5-60 sec customized ringtones from MP3, WMA, MP4/AAC, Audio CD, OGG files and now from YouTube videos or ITunes. You select the music file, edit it, and then download it to your phone. There is a graph of the song to help you choose the right segment you want. You can also make your own mobile wallpapers, send full songs to your phone, make your own mobile wap site, store your personal phone files one the server, share your ringtones with your friends from MySpace, Hi5 or post them on other blogs, send free SMS in USA and beneffit from more then 2500 premade free content items. You can get The Ringtone Maker Plus, for free if you buy it from checkoutfree.com The Ringtone Maker works in the US plus more than 65 countries and with most mobile phones that support real music ringtones and have Internet service through its carrier (e.g. Nokia, Motorola, SonyEricsson, Samsung, Siemens, Sanyo, LG, and more)..